Last week we had the pleasure of spending time at our family house in Morehead City with my some of my immediate family. 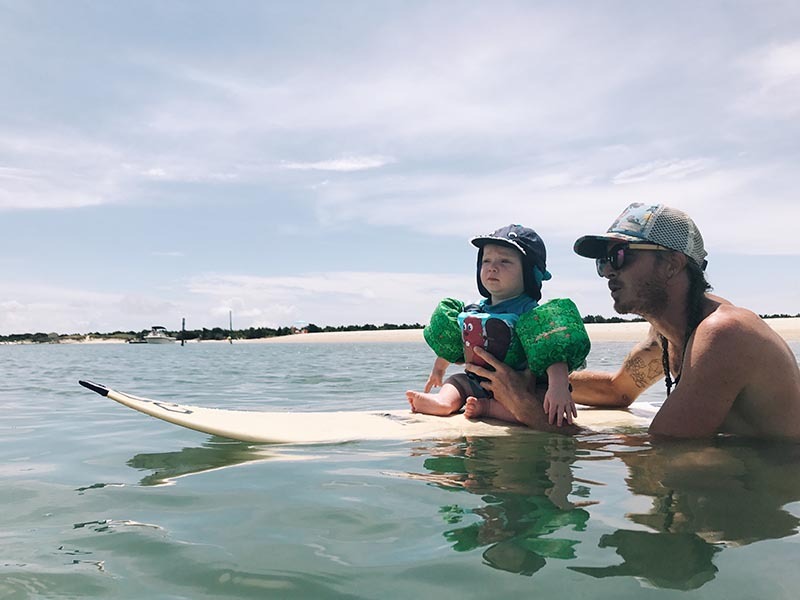 This was our first family vacation with two toddlers, and the week was the most wonderful combination of big adventures, like day spent taking the boat up to Cape Lookout, and quiet family moments, like letting the kids splash in a baby pool on the back porch. The house was built in the 1950’s by the Hillsborough Volunteer Fire Department as a seaside retreat, one that was quickly co-opted by wives and children so it became less poker lodge and more family getaway. My great uncle and great grandfather were two of the firemen, and the house remains shared by their decedents. These days my parents live just across the marsh from the house, which means that we are able to spend a good amount of time on Calico Creek, something that is undoubtably good for my soul. We mostly cooked at home this week, grilling steaks, frying grouper bites, making pesto pasta with the basil and garlic from my brother’s garden. We kept it simple, enjoying good meals around the big table that has been the platform of generations of family dinners. One evening after a day spent on Shackleford Banks we pulled all the chairs on to the front porch and feasted on a seafood boil. With the marsh lapping the side of the house at high tide we ate corn, sausage, shrimp, clams, Brussels sprouts, onions, garlic, potatoes, and mushrooms all cooked together with hot pepper. 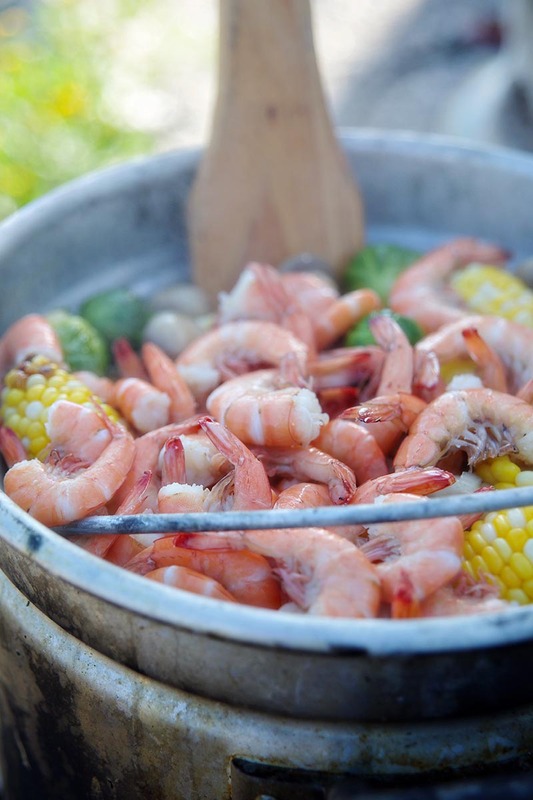 A seafood boil, also known as Frogmore Stew, a low country boil, or just a boil, can consist of whatever you have on hand. 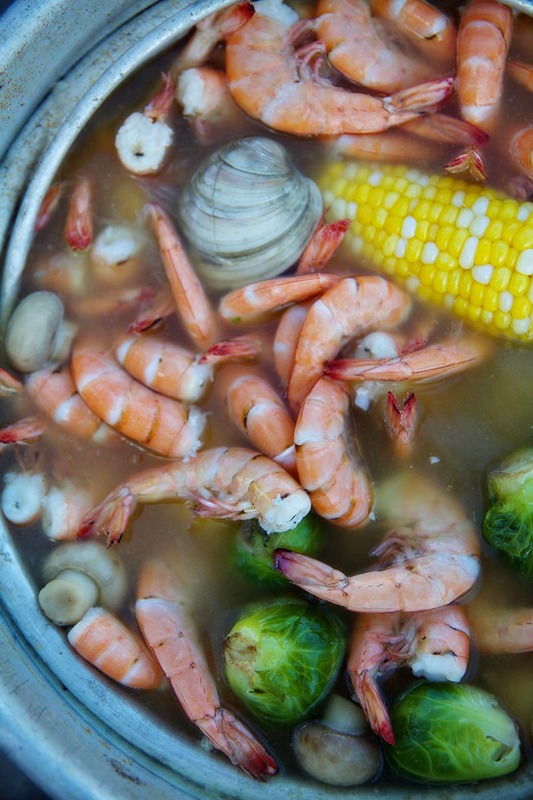 Corn, potatoes, shrimp, and sausage are staples, but the addition of everything from broccoli to crab can make for a delicious boil. The real trick is lining the table with newspaper, pouring out the boil in the middle and sitting together as you pick through the food. That’s the real fun of it. 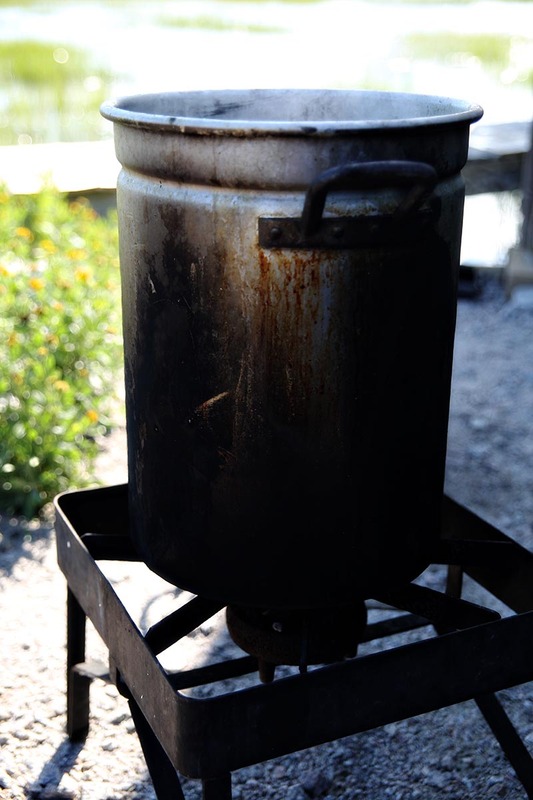 Fill a very large pot (with strainer basket if you have one) halfway with water and bring to a rolling boil. Quarter the onions and add to the pot, along with peeled garlic cloves and whole potatoes. Add sea salt, Old Bay, and Texas Pete. Halve the lemons and add to the pot. Cook for 10 minutes. Cut your sausage into 3” pieces and add to the pot. Break corn in half and add to the pot after the sausage has simmered for 10 minutes. At the same time add Brussels sprouts. Thank you! The sprouts were my sister’s idea- her husband is from Baton Rouge and she said where they live in New Orleans a lot of veggies like Brussels, broccoli, and mushrooms make their way into the boil. It was a delicious addition! A whole bottle of Texas Pete…. Yep, I bet that does the trick! 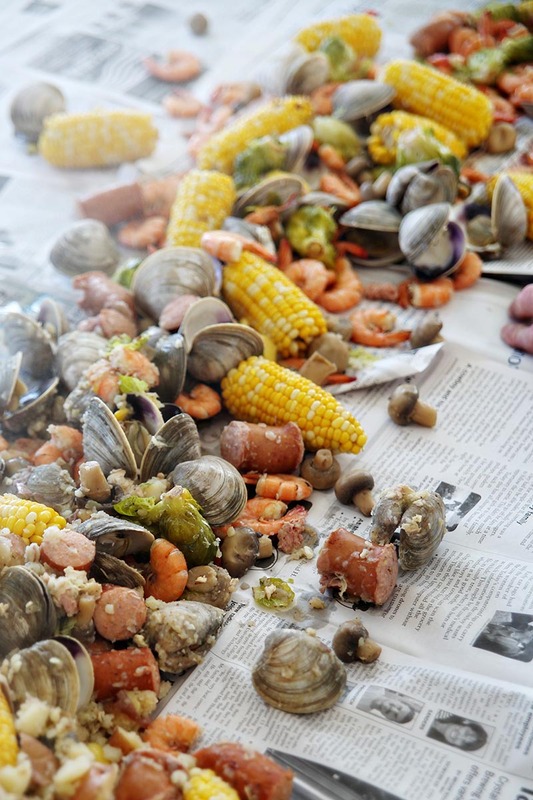 I have dreams of having a low country boil like this. It looks so tasty and so fun. But, you see, I have never tasted a proper one, so I am really nervous about cooking all this food and it being terrible. Also, nobody in my area does this. The German and Norwegian populations of this area may do really good with BBQ or in a hot dish competition, but seafood boils… nope. On top of that, both my wife and my best friend don’t like seafood (crazies), so they automatically out. Maybe one day, but really… what I want is to be invited to one. For BBQ, pick up Jack Daniels Mesquite marinade and in a large plastic bag, put the marinade and ribs into it. Add some water if necessary. Squeeze out all the air , tie up the bag and put it in the frig overnight. The next day, pull the ribs out of the bag and rinse them off. Take as much tin foil as necessary to cover up the ribs. Baste the ribs with BBQ sauce (your own or bottled) and cover the ribs completely with the foil and put into a 300 degree oven for at least 3 hours and you can go to 5 hours. They will be tasty and perfect. 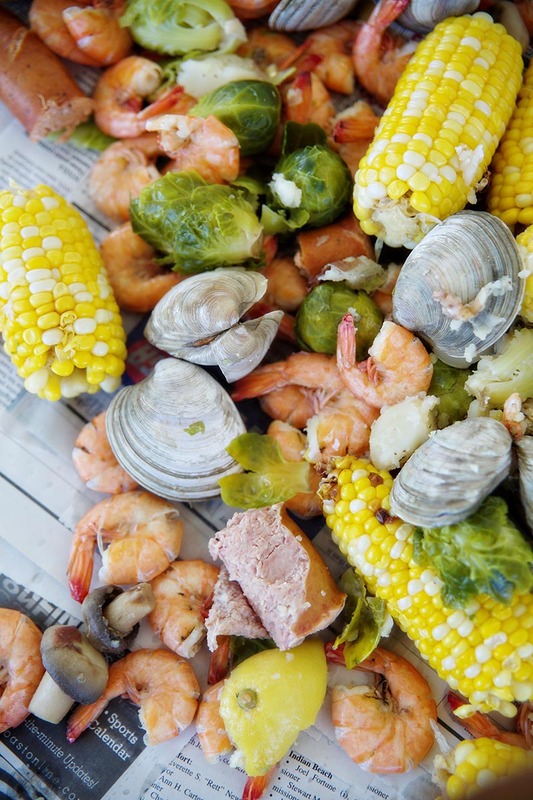 This is our FAVORITE low country boil recipe- THANK YOU!! !